"The world economy is struggling to recover from a crisis caused by inadequately regulated financial activity. Governments are dealing with deficits that are too high and growth that is too low. And, long before the credit crunch, people in the middle were struggling with squeezed living standards. For too long, economies have encouraged wealth creation focused on short term returns which failed to reward productive behaviour and skewed distribution towards the top. It is a problem that requires a fundamental re-examination." "But there is a further, deeper crisis underlying this. This is the crisis of the global environment which is now rebounding on the real economy. Resource scarcity is affecting prices, for example failed crops in one part of the world lead to rocketing food prices in another part. Energy prices have continued to rise despite the global slowdown. These are resource scarcities right at the heart of the global economy." "It is still tragically true that there are about one billion people in the world who go hungry. Solving this problem demands not only improvements in food production and distribution but economic development more generally. For instance, for those without electricity it is much harder to store food to stop it rotting. Roads are also often needed for efficient transportation." "The truth is that the economic and environmental crises have a lot in common. They have a common cause: markets without proper regulation; a common victim: working people who suffer the consequences of a problem they did not create; and a common solution: strong and active government that does not leave people to their fates." "It’s at these moments of crisis that we need to think about what kind of society we are and what kind of country we want to become. Britain needs an economy that is more resilient, more genuinely competitive, more focused on the long term and one that people feel is fairer, an economy that works for working people. Not only do we need growth, we need growth that is inclusive and sustainable. It is not a choice between creating jobs and saving the planet. We have to do both." Notice here, that Miliband’s appeal for resilience, for identity, and for unity — this national introspection — belies, again, his inability to forge a political project that can create these things. A political leader, on the other hand, with the ability to mobilise the voting public with any kind of political vision, would not be so conscious of what is lacking. 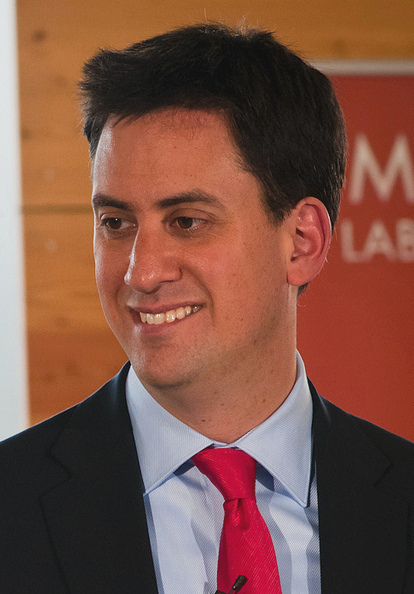 Asking us ‘to think about what kind of society we are’ means that Miliband is as confused about it as any of us. If it were otherwise, it would not need saying. Pointing out that we need ‘an economy that is more resilient’ draws our attention to the fact that Miliband doesn’t have a programme for creating it. If it were otherwise, he would need say no more than the name the programme to which we would already be committed. The emphasis on ‘inclusiveness’ and ‘sustainability’ reveal no more than Miliband’s anxiety about the future, and his impotence to deliver ‘inclusivity’. If it were otherwise, Miliband would saywhat it was that would make things ‘inclusive’, and make the future more certain. These concepts are political ideas with no objects — slogans that are no more tangible than the concepts themselves. When people build stairs, they do not start by making promises to make us taller. If Miliband is a carpenter, he has made a hollow promise. Being committed to elevation is one thing. Realising such an ambition is another. Attaching oneself to hollow slogans, and vapid political concepts is easy. And that is why Miliband needs to emphasise crisis. "When I was secretary of state for energy and climate change the mission to create jobs through clean energy and low carbon manufacturing was at the heart of my plans. At a time when the British economy is desperately in search of new sources of growth, the potential for a green industrial revolution is huge. This is the time to stand proud and declare that we want lead the world in the low carbon, resource efficient technologies of the future. The countries that make the leap first will be the successful economies of this century, exporting technology around the world to cities seeking cleaner air and lower emissions." "But is this, as Mandelson claims, an industrial revolution? A genuine industrial revolution should make it possible to produce things more efficiently, creating greater dynamism within the economy. But this green “industrial revolution” yields no net benefit. What are called opportunities are generated at a net cost, absorbing money and labour that might be better spent on producing real industrial development, or public services such as schools and hospitals. Stagnation is spun as progress. For example, it is China’s industrial dynamism, not the UK’s, which has created markets for reclaimable materials. It is only by intervention and legislation that the UK is even able to collect plastic bottles, never mind reprocess them. You don’t need to be a free-market advocate or climate sceptic to see the point. The green sector can’t yet stand on its own two feet. If we want to create more jobs, it might be more sensible to invest in sectors that are capable of producing wealth, rather than merely absorbing it." "The UK’s exports to the global wind power sector are a measly £500 million, compared to its domestic market of £4.1 billion. It’s almost inconceivable that most of that market doesn’t substantially reflect a similar ratio. And those 31,400 jobs… Given that the wind sector was subsidised, just through the ROC’s scheme, to the tune of £609.6 million that same year, we can calculate that each job was subsidised to the tune of £19,414.18. That is a problem that the REA simply do not have an answer to. The growth in the sector can only be called ‘growth’ if, in the meantime, can find the £19,414 for each of the existing 31,400 employees in the sector, and the same for each job in the sector that REA and Innovas claim will be created between now and 2020." "But this will require a much more active role for government. Almost all the technological revolutions that have spurred new waves of growth in the past have sprung from government activity. Investing in the infrastructure for a low carbon economy will both kick start the growth that is currently missing and make our economy resilient to price shocks in an age of scarcity. It is governments which set the low carbon targets and correct market failures; and the degree of support for policies shown by governments is a major part of perceived risk for investors. To attract the investment we need, governments must cover that risk and commit to a clear goal of decarbonising the power sector by 2030, as the independent Committee on Climate Change has recommended. We need to create instruments that will give the private sector the confidence it needs to invest in new low carbon sources of energy. This is, in principle, what the Green Investment Bank is for, but investors will not be fooled by a bank without proper powers." "Making markets work more efficiently can be our ally in supporting both our long term national interest, and also the current financial interests of individuals. That is why we also need to reform our energy market. Just six companies supply more than 99 per cent of consumers’ electricity and gas. They also generate two thirds of the country’s electricity. This stops the market from being open. One result is that when wholesale prices go up, so do people’s bills. Yet when wholesale prices come down, too often bills do not. This is caused by a lack of transparency in the market and the fact that having just a few large dominant firms means the price is never forced down. The market needs to be opened up to new entrants. We are looking at ways to encourage all energy companies to sell the power they generate into an open pool, so that any retailer can buy it, thereby encouraging more competition." "The United Kingdom has been a pioneer in deregulating and liberalising energy markets through price decontrol, the closure of inefficient coal mines, the removal of subsidies, privatisation and the introduction of competition and open access to electricity and natural gas networks, regulated by an independent regulatory body. Today, there is virtually no state ownership of energy assets and all markets are competitive." "The Government wants people to believe their electricity will become cheaper. It will not. It will become much more expensive." Gardiner admits that renewable energy is more expensive than conventional generation. He knows it. And since he is so close to Miliband, we must assume that Gardiner has told him. If he hasn’t, what exactly is hisSpecial Envoy for Climate Change and the Environment telling him? "Energy bills are now one of the biggest costs that families face, but the complexity of the various tariffs on offer, currently over 400, means that 80 per cent of people are paying too much for their energy. Elderly customers often find it hard to shop around and make the market work for them. That is why a Labour government would ask the energy companies to charge all customers over the age of 75 the cheapest tariff for gas and electricity, enforceable by law." This is nothing more than grandstanding. Why should only the over-75′s enjoy the protection of the law? Is it okay to rip off a 74 year old, but a crime to charge him over the odds the very next day? And what kind of promise is guaranteeing the ‘lowest possible tariff’ while he has done everything in his power to make electricity more expensive? It is a classic Labour Party move — to give with the one hand while taking much more away with the other. "We need growth to serve a purpose: raising aspirations, improving the quality of life, and passing on a better inheritance to the next generation. Sustainability is about the politics of hope and the human endeavour to create a better legacy. People are aware of the risks and opportunities facing us. Over half a million people signed a petition against the government’s plans to sell off our forests. Even more have joined the Fish Fight campaign lobbying for an end to the disgraceful practice of discards and calling for a sustainable fishing industry. Millions tuned into Frozen Planet to watch Sir David Attenborough’s plea to save the Arctic, a cause whose time has come." Miliband’s idea of ‘responsible growth’ seems to imagine that a regime of deliberately ‘irresponsible growth’ once reigned. But not even ‘growth’ is a problem the UK enjoys, responsibly or irresponsibly. Rather, the ‘responsible-’ prefix is a caveat to any promise he makes to deliver anything positive at all. It’s a bit like ‘sustainable development’. ‘Sustainable’ is in fact interchangeable with ‘not’. Thus, ‘sustainability’ is a celebration of more primitive lifestyles, of lower living standards, and of regressive political ideas. Milband speaks about ‘improving the quality of life’ as though it had never been conceive of before, and that it was done without oil, gas or coal; without machines and wealth. Concepts like ‘human endeavour’ and ‘hope‘ come easily to vapid poseurs, who have only online petitions and a TV programme to draw from, but who struggle to get people to vote for them, much less out into the streets. "This is something that goes to the core of Labour’s values of fairness, equality, and social justice. The great Attlee government was not just about the National Health Service and creating a post-war economy. It was also the government that legislated for our National Parks and to protect the diversity of our countryside. From ancient woodlands and wildlife rich wetlands, through to community orchards and local parks, there are some things that provide a value that cannot be captured by the free market. Times have changed, but the principle remains the same: markets have limits. The campaign against the forest sell off showed that the public gets this, as did opposition to the government’s planning reforms. Rather than being a barrier to growth, I see the environment as a source of inspiration and opportunity to create long term sustainable jobs; globally competitive businesses; reduce inequalities and the fairer distribution of resources and wealth." "The environmental crisis poses a big challenge to our politics because it is marked by a distance between the generation that needs to act and the generations that will feel the greatest benefit. Bringing about change requires government to play a greater role in making markets work to deliver the best possible outcome." "Of course, if government was the only agent for change, a shift towards a more responsible, sustainable capitalism would be far harder. I will not deliver change alone but by building a coalition of business leaders from companies large and small, politicians, NGOs, social entrepreneurs, investors, employees, consumers, citizens, and trade unions. Such coalitions come along rarely in politics but when they do they make real change possible, driving out old orthodoxies and establishing new ways of conducting our lives together." "The job of politicians is not just to put forward some of the ideas that can contribute towards creating a more responsible and sustainable capitalism, it is to help build the coalition for change that will support and make these changes happen in practice."